Overlooking the fertile plain of Lucca in northwestern Tuscany, Valgiano sits high up on the hillside among elegant summer residences. The 25h estate has been certified biodynamic for ten years now and the combination of a warm Mediterranean climate and cool nights make for ideal wine grape growing. The vines are hand-harvested, native yeasts for fermentation, and careful, artisanal work in the cellar ensure wines of character and vibrancy. Winegrowers: Moreno Petrini and his wife Laura di Collobiano who bought the estate together in 1993; and Saverio Petrilli, a leading figure in the Italian biodynamic movement. Palistorti White Toscana IGT, 2014…..50% Vermentino, 25% Malvasia and Trebbiano, 20% Sauvignon Blanc and Chardonnay Named after the twisted posts that hold up the vines (the soil and subsoil is full of rocks), this intense and fruit-filled wine is marked by ripe citrus and crisp, pineapple flavors. Palistorti Red Colline Lucchesi DOC, 2012…..70% Sangiovese, 15% Syrah, 15% Merlot Notes of iodine & rich aromatic herbs underpin a silky fresh blackcurrant mouthfeel and an elegant, smooth-as-velvet finish. 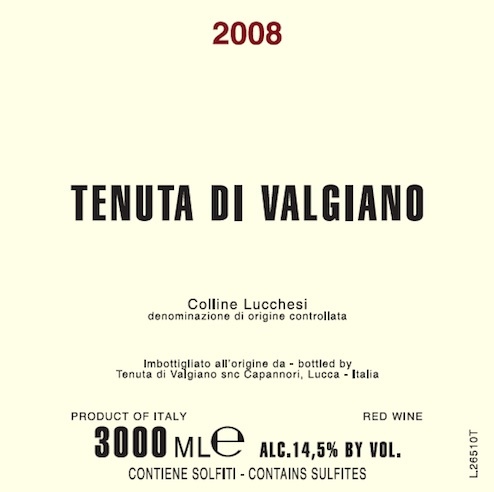 Tenuta di Valgiano Red Colline Lucchesi DOC, 2012…..70% Sangiovese, 20% Syrah, 10% Merlot A rhythmic, vital wine with layers of black fruit flavors and fine gripping tannins that melt in the mouth – concentrated and complex, ripe and succulent.